Jerome Jackson, paralyzed from the waist down since age 14, is facing eviction from his wheelchair – accessible Inkster home built specially for him, by the combined actions of Community Living Services, Wayne County, PNC Bank, and Fannie Mae. CLS is a non-profit organization funded by taxpayers, through the Wayne County Health and Human Services and other government agencies, while PNC Bank was the loan originator and servicer of the mortgage and a recipient of TARP Bailout funds and other tax-payer assistance. 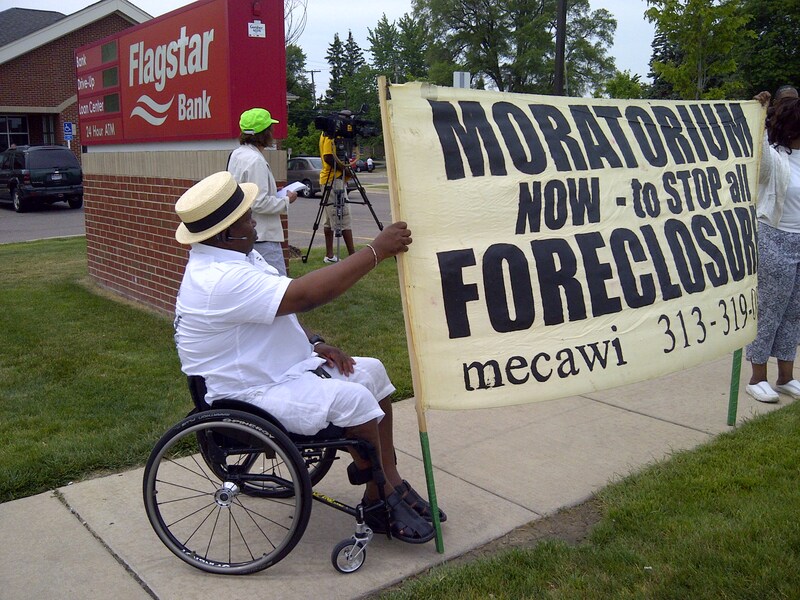 Fannie Mae owns the mortgage and is ordering the eviction. Fannie Mae is the mortgage industry behemoth, that along with Freddie Mac, controls about three-fourths of the mortgage industry. Freddie Mac and Fannie Mae were taken over by the Federal Government in 2008, and placed under the control of the Federal Housing Finance Agency, and should, therefore, be working on behalf of the people instead of carrying out evictions for the banks and investors. Over the past several months, the negotiations have been by stymied by the refusal of CLS to honor a commitment made to Jerome in 2004 to pay 85% of the monthly mortgage payment, including taxes and insurance, making it possible for him to afford a wheelchair-accessible home. In 2009, CLS broke its promise and stopped paying its share of the monthly payment, causing the mortgage to go into default. CLS’s behavior runs contrary to its own “Guiding Principles”. CLS states that “No, I can’t” must be replaced by “How can we make this happen?” (http://www.comlivserv.com/principles.htm). It is the responsibility of CLS to figure out how to undo the damage it has caused, by finding the funds to make things right. To CLS: Make it happen NOW. Jerome did not cause the mortgage to go into default! Ten years ago, Jerome was living in an apartment in downtown Detroit and receiving support and assistance from CLS, the Wayne County agency. In 2004, CLS told Jerome that rental housing was getting too expensive, so he should buy a house. He was also told that some of the caseworkers assigned to provide services to him did not like coming to Detroit, so a home was built twenty miles away in Inkster! CLS and Wayne County promised that they would assist Jerome with the down payment and monthly mortgage cost for a home that was wheelchair accessible. Jerome agreed to this proposal, and (based on the commitment by CLS), PNC Bank originated the mortgage for the home Jerome bought in Inkster. PNC Bank, CLS and Liberty Tree Housing all agreed that the loan would provide Jerome with a wheelchair accessible house, including wider doors and a ramp. Jerome Jackson entered into a mortgage where the monthly payment, including taxes and insurance, was about $900 per month. Jerome’s only income was SSI at little more than $600 per month, so there was no way he could pay the mortgage without financial assistance from CLS / Wayne County. All parties— including the bank— understood this. In 2009, CLS stopped paying their portion of the mortgage. They have since refused to honor the commitment they made to pay the bulk of the monthly mortgage payment, which was the only way Jerome could afford the home. Without the support that CLS and Wayne County had promised, the mortgage went into default. CLS had convinced Jerome to buy the home in the first place, then reneged on their agreement and left him to face foreclosure and eviction. PNC Bank, and now Fannie Mae (which insured the loan and bought the home at Sheriff’s auction), have refused to work with Jerome and have filed a complaint to evict him from his home. The lender, the builder, CLS and Wayne County all knew and understood that the only way Jerome Jackson could purchase his home was with regular housing support from CLS. Now when CLS decides to stop paying, they all agree that Jerome Jackson should be evicted from his home. Jerome Jackson and his family disagree. We are calling on CLS / Wayne County to honor their commitment to Jerome Jackson and take all necessary steps to keep him in his home, where he lives independently and with dignity. The mortgage must be reduced to current market value with a low interest rate, and Jerome’s monthly payment must be reduced to 15% of the new mortgage or even free.